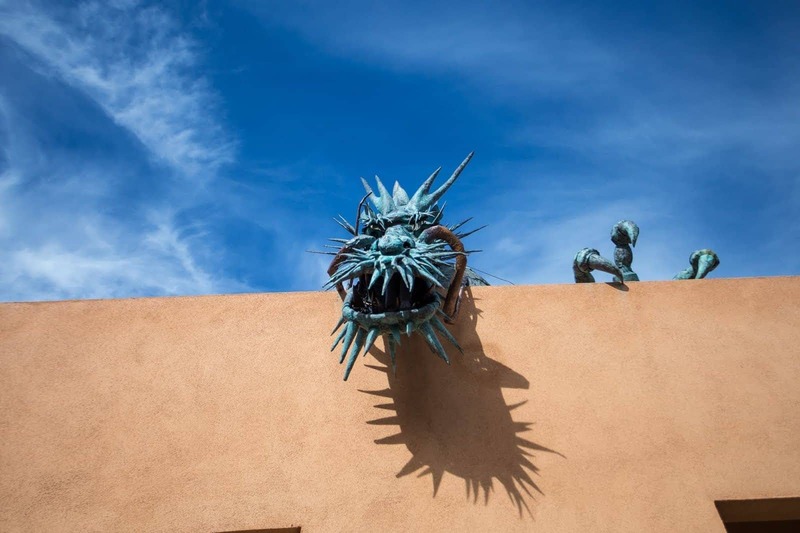 As part of our five week epic road trip around New Mexico, we spent a few days exploring Santa Fe, the state capital. Located about an hour’s drive north of (the much bigger!) 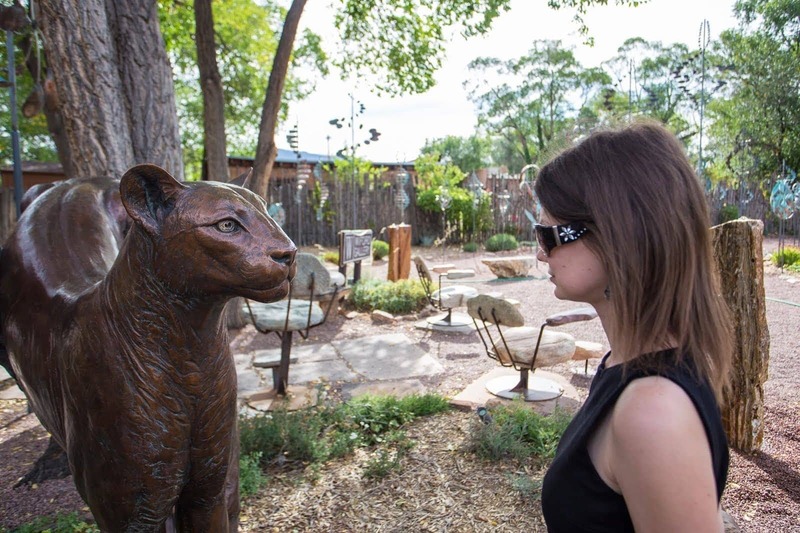 Albuquerque, Santa Fe has long been known as a laid back place that is popular with artists as well as folks looking to explore the outdoors. We spent our time visiting museums, eating, taking photos and generally exploring everything the state capital has to offer. From that, we’re delighted to share with you our ideas for some of our favourite things to do in Santa Fe. 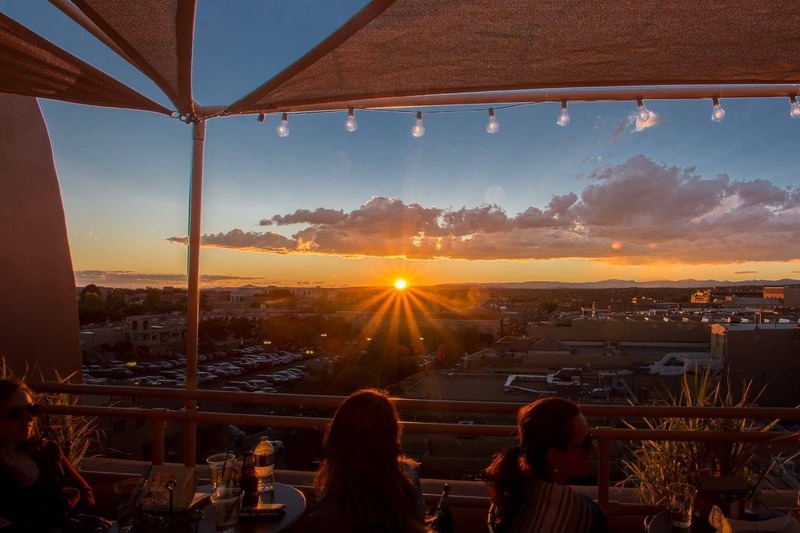 Our guide to things to do in Santa Fe covers a range of activities, from cultural attractions to the best place to enjoy a sunset cocktail. Enjoy! If you’re from the US (and even if you’re not), the chances are you have heard of Georgia O’Keeffe. She was the artist who essentially put American modernism on the map, and she spent a great deal of her life living and painting in the area of New Mexico near to Santa Fe. Visiting the Georgia O’Keeffe museum in Santa Fe is definitely a good way to get up to speed on the artist, as well as enjoy some of her many works. 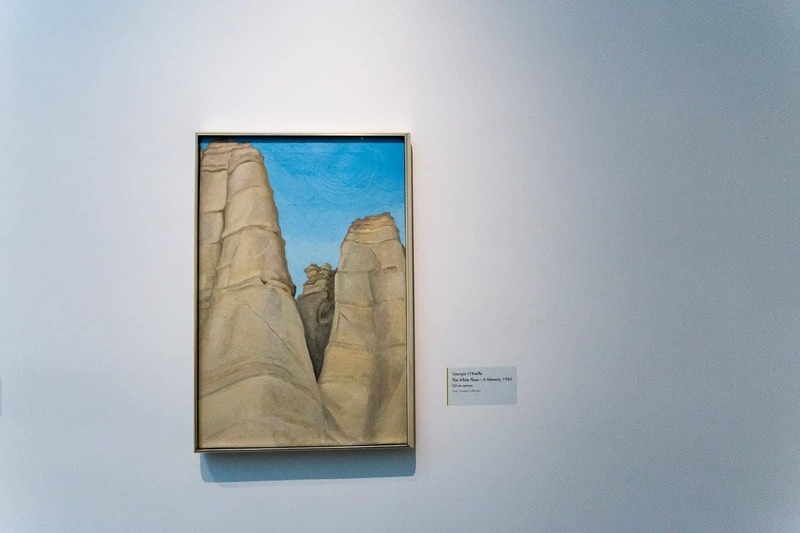 We particularly enjoyed visiting as we had been to a number of the locations around the Abiquiu area where she drew much of her inspiration, and it was nice to see her depiction of scenes like the white city and chimney rock. 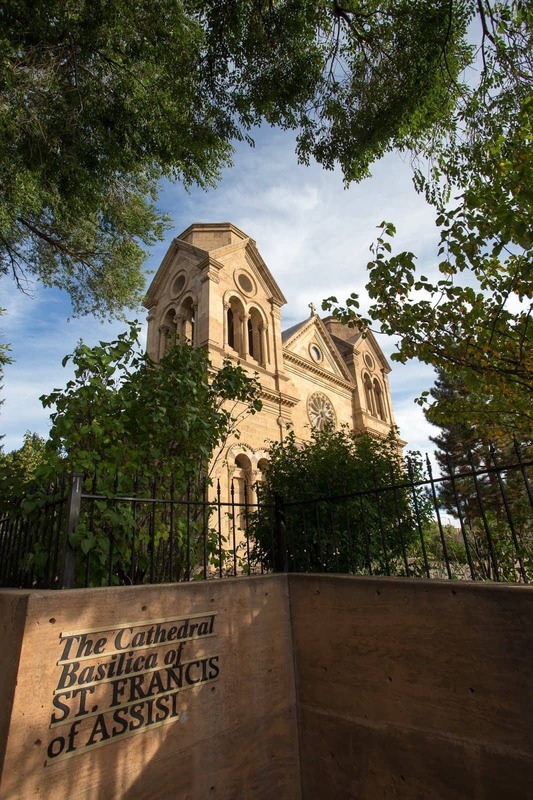 One of the most popular things to do in Santa Fe is to visit the Loretto Chapel. This is a lovely little chapel in downtown Santa Fe which is particularly famous for having a “miracle” staircase. 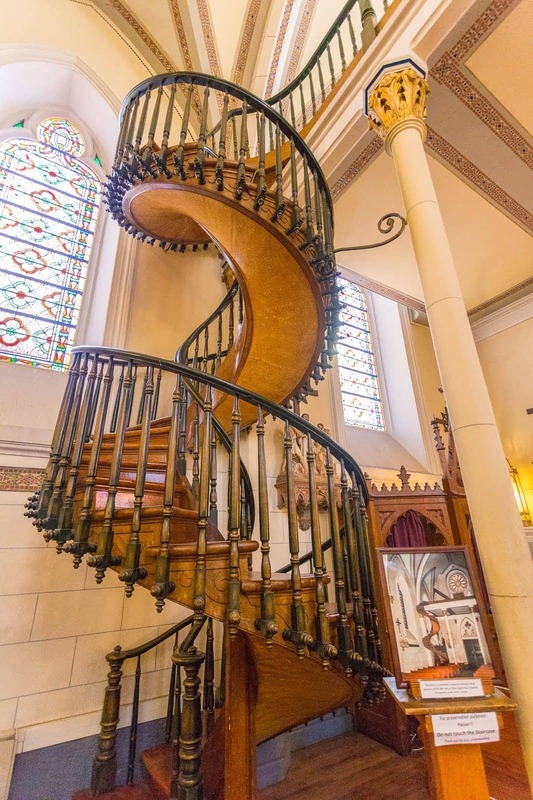 Constructed by a mystery carpenter, this beautiful spiral staircase stands with no apparent means of support, completing two 360 degree turns as it ascends towards the roof of the church. Whilst the truth is a little less exciting, it is still worth visiting. The craftmanship on the staircase, built by hand in the 19th century, is very impressive, and the chapel itself is beautiful. About a twenty minute drive south of Santa Fe is El Rancho de Las Golondrinas, or the Ranch of the Swallows. 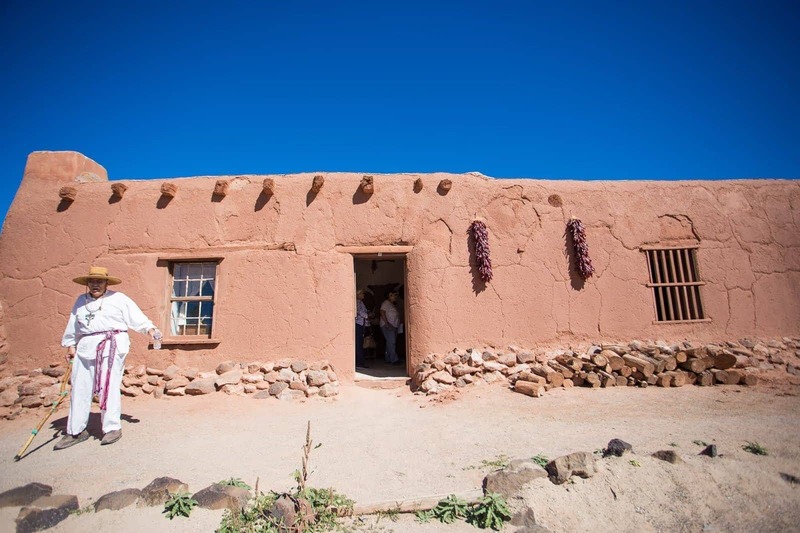 This is a living history museum, situated on a 200 acre ranch, which is dedicated to the history, heritage and culture of 18th and 19th century New Mexico. They offer both self-guided tours and free (with admission) guided tours, and we would definitely recommend doing the latter if you can. We learnt all about the history of life in this area thanks to our well informed and entertaining guide, who showed us around a number of the key buildings on site. Then we were able to explore the rest of the property by ourselves. You definitely want to set aside a few hours for exploring. As well as the guide, there are costumed “villagers” to find and interact with, a hacienda, water mill, schoolhouse and more buildings to explore, plus there are events throughout the year to attend. After a lot of exploring, you’re going to want to relax with a cocktail. Or a beer. Or a nice chilled glass of wine. Or something entirely non-alcoholic. Whatever your choice, a wonderful place to enjoy it is going to be the rooftop bar at the La Fonda hotel. There has been some kind of travellers lodging on this site for over 400 years, although today’s hotel is a little younger, dating from 1922. It’s certainly one of the premiere hotels in the city, with a fantastic central location, and multiple dining options. It’s the fifth floor rooftop bar that I’m suggesting you visit. From here you get panoramic views over the whole city, and far off into the distance. It’s particularly popular for sunset, when you can have a drink and a few nibbles. It does get busy, so arrive early if you want to sit down! Time for some culture! The Museum of Indian Arts and Culture is dedicated to helping visitors learn all about the native inhabitants of this part of the world, and features everything from archaeological exhibits to art pieces, jewelry and more. Over 75,000 pieces are in the collection (not all on display! ), and we’re sure you’ll learn a thing or two during your visit. 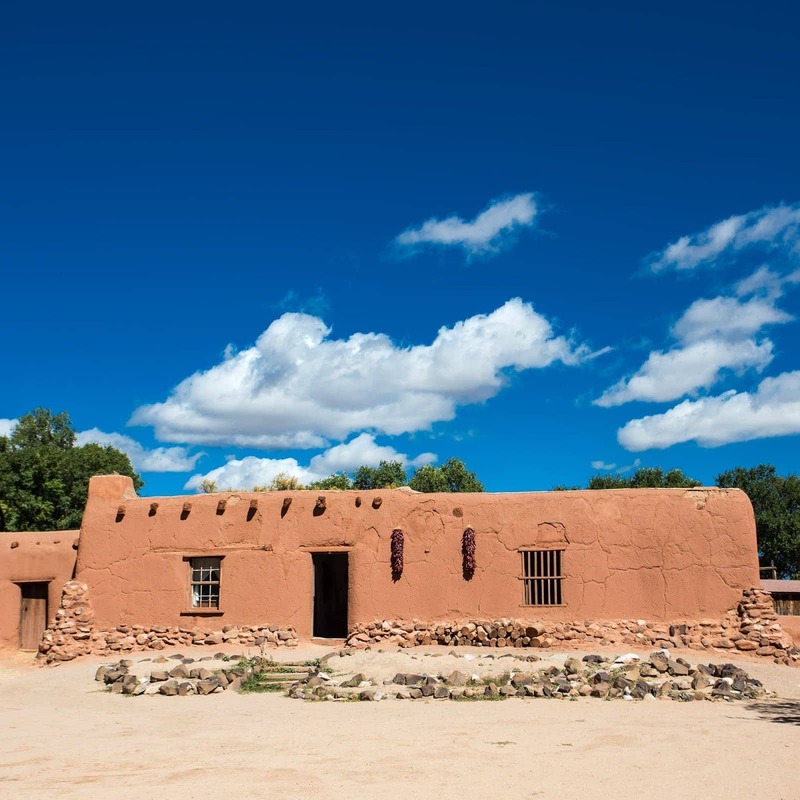 Built in 1610 and once the seat of the Spanish government in what was then the Spanish controlled southwest, this 17th century building now houses displays on the history of Santa Fe, as well as the region. It’s also the oldest continuously occupied public building in the United States! 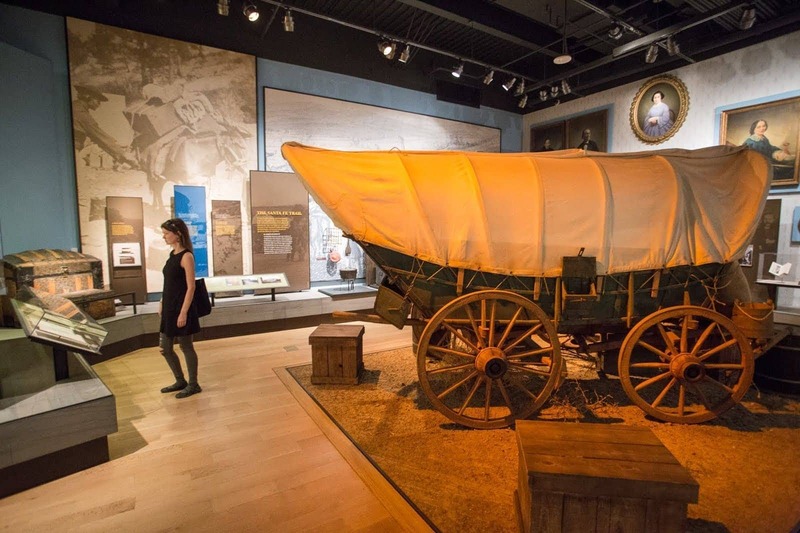 Right next door to the Palace of the Governors is the New Mexico State History Museum, which, as the name suggests, will teach you all about the history of the region, from the native people, through to the Spanish conquerors, right through to the present day. There are also temporary exhibitions. When we visited, one of these was on the history of lowriders in the area, which I found very interesting. Whilst not the oldest house in the USA, the De Vargas street house in Santa Fe does date from 1646, which certainly makes it one of the older Spanish era properties in the country. It’s now home to the Oldest House Museum, which consists of a couple of rooms inside the house which you can tour to get an appreciation of how these structures were built. 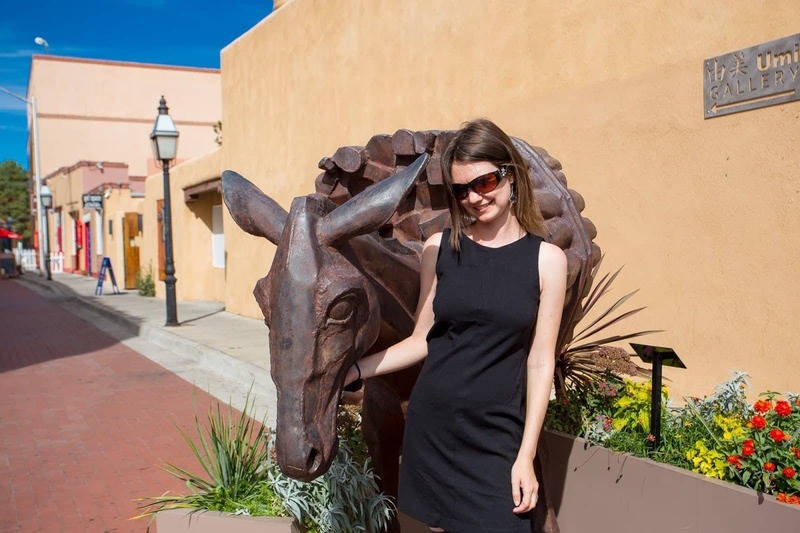 As I mentioned at the start of the post, Santa Fe is well known as an artistic community. 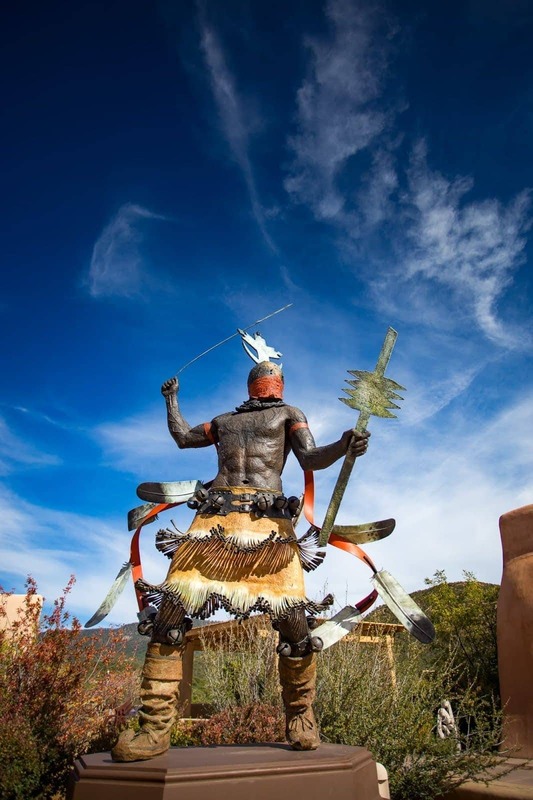 One of the best places to explore this in on Canyon Road, home to multiple galleries showcasing all sorts of art, from Native American pieces through to sculpture, pieces that move in the wind – everything really! We really enjoyed wandering the street and popping into various galleries to see what was on display, although many of these are fairly serious places so the prices were somewhat out of our budget! But it’s definitely worth exploring, you might find something you love! In the same part of town (up on Museum Hill) as the Museum of Indian Arts and Culture is the fun Museum of International Folk Art. With a collection of over 130,000 objects from 100 nations, it’s the largest collection of folk art of its kind in the world. Exhibits rotate so what you see will vary, with the exception of the long term Girard Collection, which was one of our favourite parts of the museum. 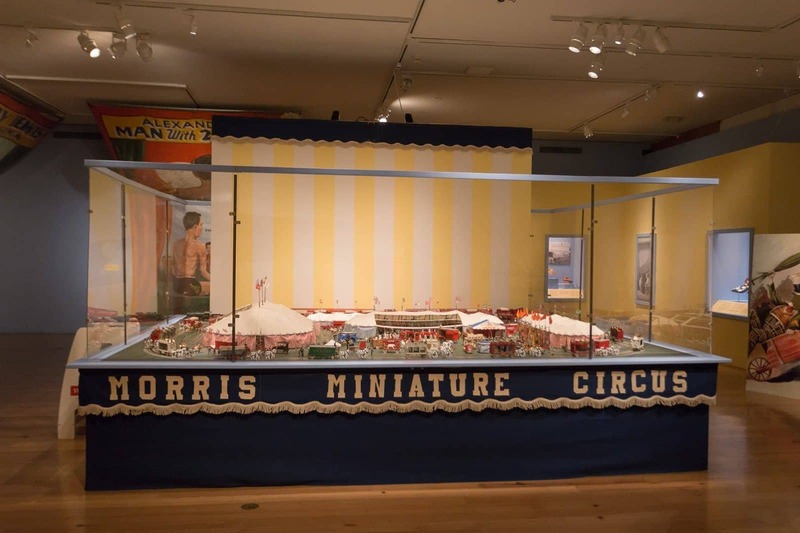 Consisting of hundreds of miniatures, which range from bull fighting rings through to depictions of life in US towns across the years through to, well, pretty much everything you can imagine. There’s a lot to see and we guarantee you’ll spend more time here than you were planning! 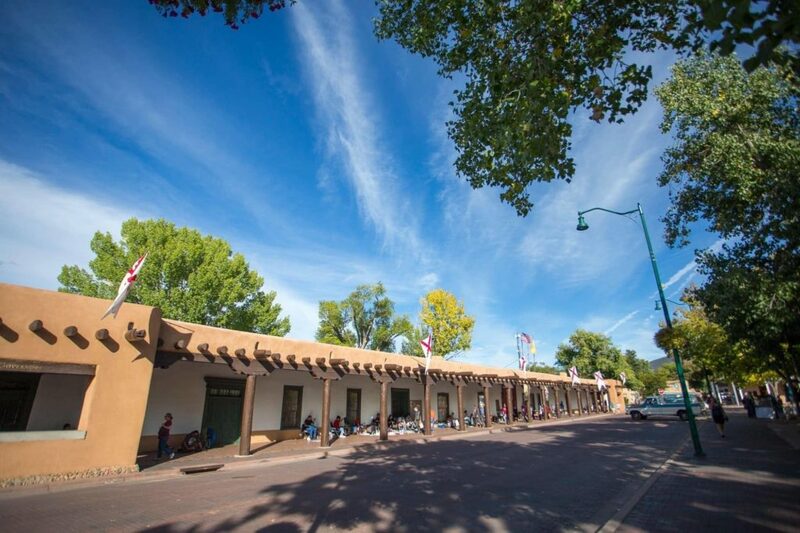 For over 400 years the Santa Fe Plaza has been at the centre of life in the town, so we suggest you would want to take a bit of time to enjoy this history. Depending on when you visit you might find a concert or dance going on, or a community gathering, or a market of some kind. All along the wall of the Palace of the Governors you’ll also find artisans selling traditional New Mexican crafts. This is a result of the Native American Vendors Program, which has seen traditional Native American crafts sold here for over six decades. If you’re looking for an authentic piece of native New Mexican art, this is a good place to come. And now for something completely different. At the site of a former bowling alley sits the massive Meow Wolf venue. Part art installation, part interactive puzzle, part… well, it’s hard to describe. Visiting Meow Wolf is like waking up inside a video game, or a choose your own adventure story. It’s beautifully crafted, the result of over 100 local artists all working together, and will definitely entertain you, even if you leave with a sense of not quite knowing what it was all about. We visited meaning to stay for an hour, and ended up there until they closed! 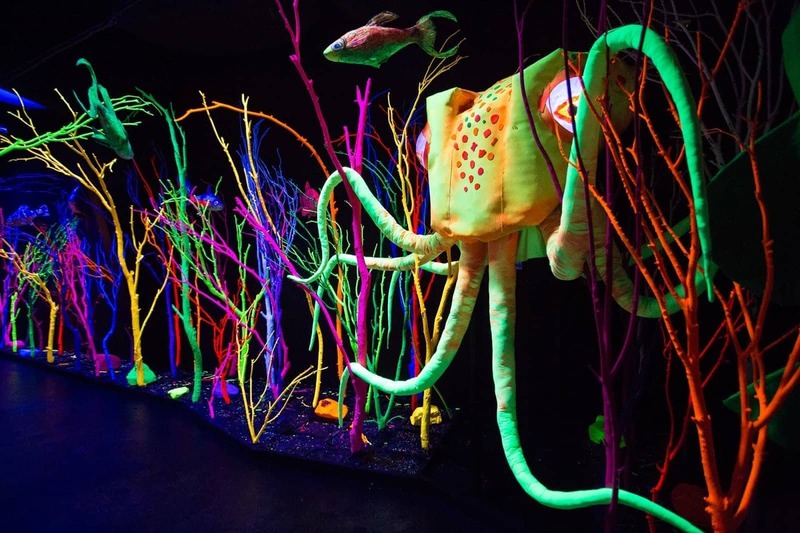 If you’re looking for something really unlike anything you’ve been to before, you’ve got to head to Meow Wolf. Santa Fe is a town of beautiful adobe structures, so this Romaneque style basilica is a bit of a shock on first sight. 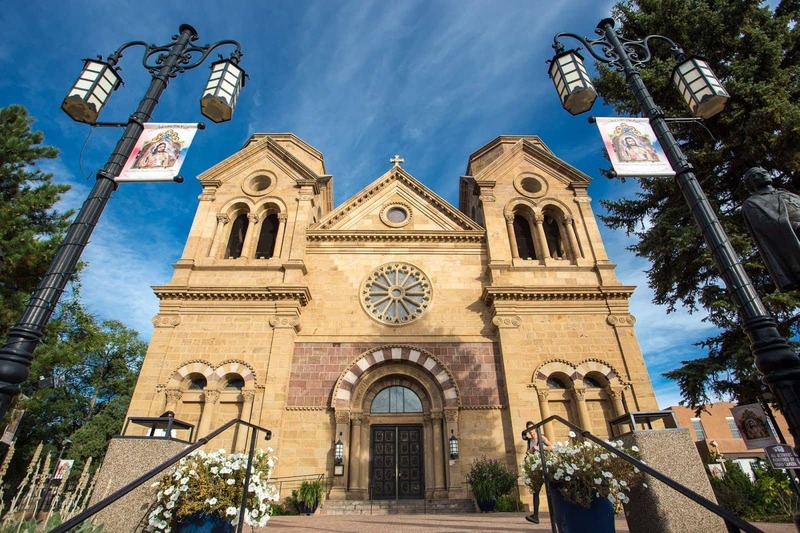 Built in the 19th century, the Cathedral Basilica of St. Francis of Assisi is quite beautiful from the outside, but also worth heading inside, as there are a number of uniquely New Mexican touches that are worthy of your time. Speaking of churches, you should also visit the San Miguel Mission if you have the time. Dating from 1610, this is believed to be the oldest church in the United States, a testament to how long an adobe building will last if properly maintained and cared for. Last, but not least, on our list of things to do in Santa Fe – the Santa Fe Railyard. Once a key interchange for 19th century train traffic, today the Railyard is more focused on entertainment, shopping and dining. There’s a regular farmer’s market, plus in the summers you can come by and watch a movie on the lawn. 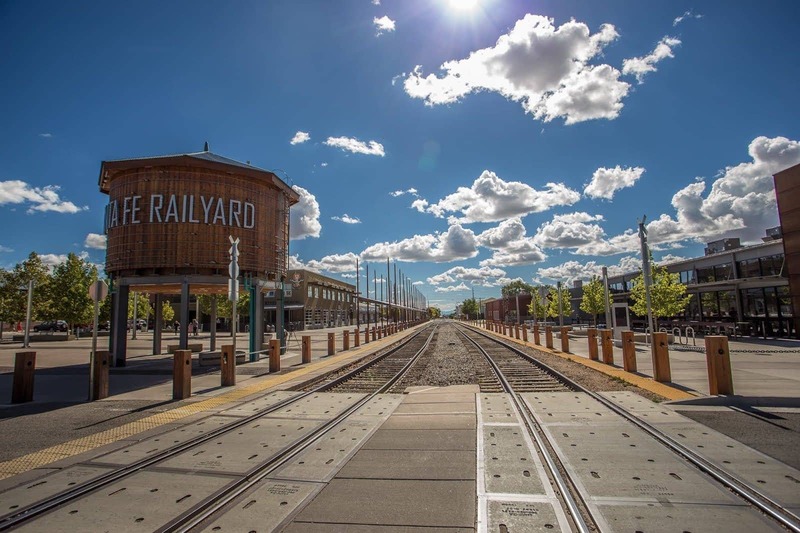 The Railyard is also where you come to catch a train down to Albuquerque – the Rail Runner service. 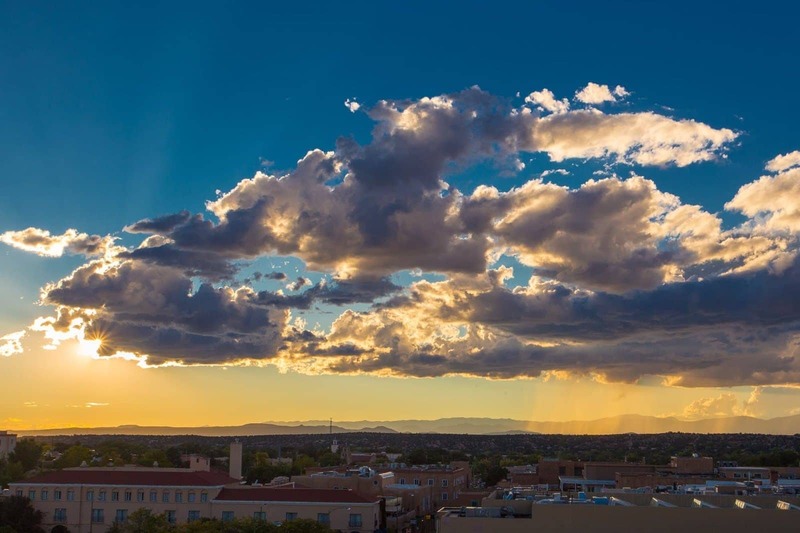 Santa Fe is a good destination to visit year round, but you should be aware that it is at relatively high altitude (7,000 ft above sea level), and is also a ski destination, so winter snowfall and cold temperatures are to be expected in the Winter months. It’s also an arid climate, although summer monsoon rains can bring bursts of humidity, and temperatures in the summer months can exceed 90F. Rain is most common July – September, and even hot summer days can have cool nights, so you’ll want to bring appropriate clothing. 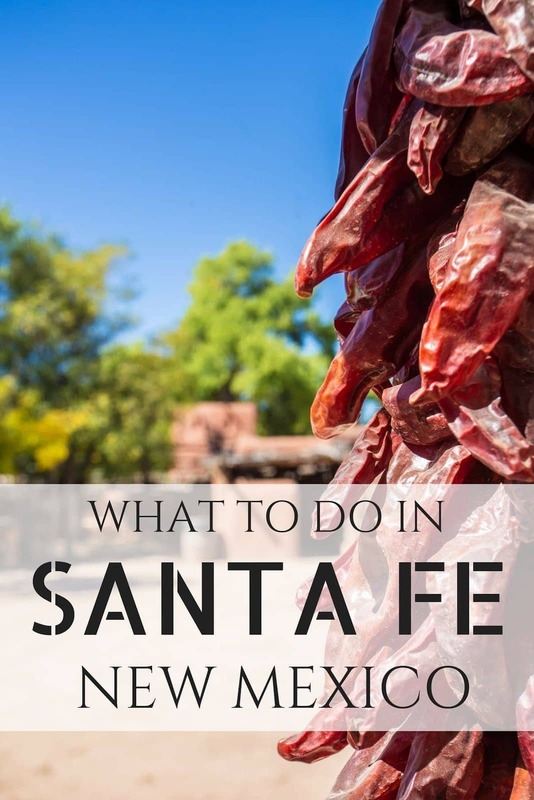 So really, it’s up to you and what you want to do in and around Santa Fe! For winter activities, you’ll obviously want to visit in Winter. For general exploring, I’d suggest Spring and Fall would likely be a good balance – reasonable temperatures and less people. Summertime is definitely busier, with weekends booking out fast. There are also a number of festivals throughout the year, in particular the Indian Market in August, where rooms can be booked out up to a year in advance. Also, keep in mind that during the Albuquerque International Balloon Fiesta, Santa Fe will also likely be busier due to the high number of visitors to the region. Santa Fe does have an airport, with flights to Texas, Arizona and Colorado at time of writing. If you want to fly from further afield, you’ll likely want to fly to Albuquerque, and then make your way up to Santa Fe. Between Santa Fe and Albuquerque there’s an excellent and regular train service, otherwise it’s an easy 1 hour drive. There are currently no major bus lines servicing Santa Fe – you’ll have to travel into Albuquerque and then make your way from there. 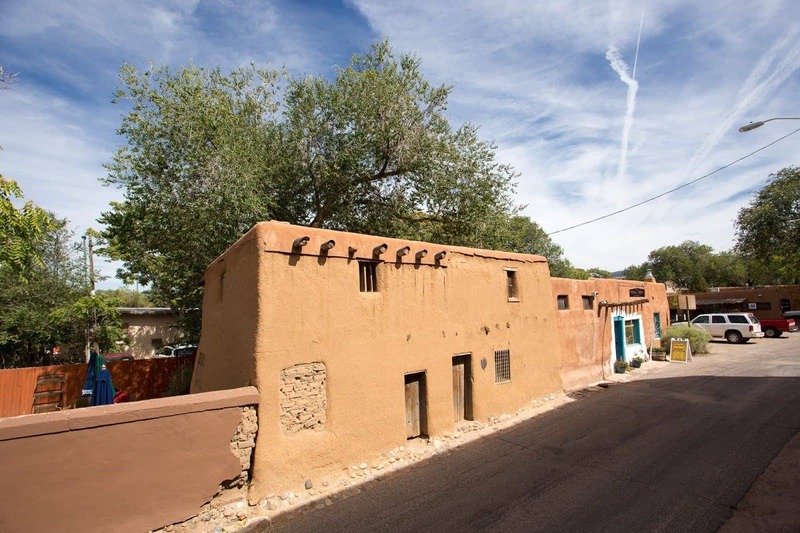 There are plenty of accommodation options in Santa Fe, everything from the previously mentioned centrally located La Fonda through to lodges and motels. We stayed in an AirBnB when we visited, which was perfect for our needs. See below for our tips on getting the best deal on your accommodation when you travel. Finding the best deal on your accommodation is an important part of travel planning, helping you to get the most from your budget, as well as find the property that is right for you. Our current favourite way to find the best deals on accommodation is with Booking.com. They have a wide range of choices, good prices, and are super easy to use. Check out their Santa Fe listings here. If you prefer an apartment or private room, then we recommend AirBnB. We’ve tried all the others, and AirBnB consistently has the most options for locations around the world. Plus, if you’ve never used them before, you’ll get up to a $100 discount if you sign up with this link. (Discount varies by currency and if you choose to host at some point). If you can’t find what you want on AirBnB, or you want some new options to try out, we have some alternatives we also use. We suggest trying VRBO, Flipkey or HomeAway to start with. For even more ideas to help you save money and get the best choice, we wrote a whole post on the best alternatives to AirBnB which you should check out! Our trip to Santa Fe was part of a much longer trip exploring the wonderful state of New Mexico. We’ve written a number of posts about out experiences and will be sharing more. In the meantime, here are a number of resources that you might find useful for planning your Santa Fe (and New Mexico!) trip. We’ve also written guides to things to do in a number of other cities across the USA, including things to do in San Antonio, things to do in Albuquerque, things to do in Cambria, things to do in Santa F, things to do in Santa Cruz, a guide to New Orleans for Mardi Gras, things to do in Baton Rouge and things to do in Savannah to name but a few. See our complete USA content here. And that sums up our guide to what to do in Santa Fe, New Mexico! Have you ever visited this town? Do you have anything you’d like to add? Let us know in the comments below! So you know, Santa Fe tourism supported our trip by arranging discounted or free access to a number of the attractions listed above. We covered all the other costs of the trip, including lodging, transport and food. As always, you can see our code of ethics for information on how we choose who to work with! Walking Tours of New York: Disney, Liberty, Food and More!